I got this inquiry the other day: “i am looking for a dialysis cushion for a chair” So, in the For What It’s Worth Department, I have used a yoga pad and a gymnastics pad. Here are my thought about them. 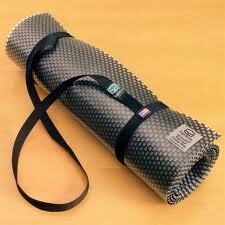 The Yoga pad (on the left) is about 1 inch deep, about 30 inches wide and 40 inches long. It was pretty adequate for the job and easy to carry because it could be easily folded. The only problem was that it was not thick enough for me. I found a gymnastics pad (the blue one below) that is about 2 inches thick, 40 inches wide and 60 inches long. It exactly fits the chair. The drawback is that it was actually too thick for me in a new chair at the facility. It boosted me too high. And, because it is so thick, it can only be folded into three sections and that makes it less easy to carry. Also, because it is so long it spans the entire length of the chair and covers the foot pad. That makes it difficult to push myself back up when I slide down. However the cheap chairs we use are already breaking down and so I’ll probably be using it again. Both pads don’t help if you get too warm and start sweating because they are covered in vinyl and so they don’t absorb anything. A cloth to cover them may resolve that issue. My practical choice is to use the gymnastics mat over the yoga mat because it fits so perfectly and is really comfortable. Before you buy anything, measure the chair you are using. You don’t want a mat that’s too large and you don’t want one too small. But one smaller than the chair is better than too large. 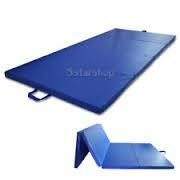 The mat should fit inside the chair and be long enough to span the back and seat of the chair. Get as close as you can to the dimensions of the chair you use. Let me know what you do so others can learn, too. This entry was posted in dialysis, Dialysis Center, dialysis chair, dialysis equipment, New Patient, pad, patient care, thoughts and tagged dialysis, ESRD, hemodialysis, kidney, pad, patient. Bookmark the permalink. Thank you for the helpful information that you provide and for your courage in continuing to look for a better way of doing things.